Anna Jenczak was born in 1991 in Szczecinek, North Poland. Since 2010 she was studying Chemistry at Adam Mickiewicz University in Poznań. In 2013 she received her Bachelor’s degree for the work entitled „Functionalized dendrimeric complexes of analoges of 4-formylbenzoboronic acid anhydrides with amines”. The same year she began her Master’s degree in the Prof. A. Katrusiak research group. She was responsible for high-pressure crystallography. In October 2015 she started her PhD studies in the Stefankiewicz research group where she will be working on the dynamic metal-organic frameworks. Michał Kołodziejski was born in 1991 in Radziejów, Poland. Since 2010 he studied chemistry at the Adam Mickiewicz University in Poznań. In 2011 he joined the research group of Professor Violetta Patroniak, where he investigated complexes of Schiff base ligands with d-electron metals ions. In 2013 he completed his Bachelor’s project titled: „The complexes with N2O-donor ligands – synthesis, characterization and biochemical properties”. In the same year he began his Master studies and joined the Stefankiewicz research group. Wojciech Drożdż was born in 1991 in Częstochowa, Poland. Since 2010 he is studying Chemistry at Adam Mickiewicz University in Poznań. In 2012 he joined to the group of Professor Henryk Koroniak, where he was investigating fluorinated compounds containing phosphonium groups. In 2013 he reveived his Bachelor’s degree for the work entitled „Synthesis and application of fluorinated imines”. The same year he began his Master’s degree in the Stefankiewicz research group. Marcin Konopka was born in 1992 in Poznań, Poland. He started chemistry studies in 2011 at Faculty of Chemistry of Adam Mickiewicz University in Poznań. Since 2013 he was a member of Prof. M. Kwit research group. His research dealt with chirality transfer in trityl system. In 2016 he recived his Master’s degree in chemistry for the work entitled Dynamic chirality induction in triphenylmethanes. The same year (2016) he joined the Prof. A. Stefankiewicz research group where he started his PhD studies. Now he works in dynamic combinatorial chemistry (DCC) of disulfide molecular cages. Grzegorz Markiewicz was born in 1992 in Poznań, Poland. His passion for chemistry began already in the middle school. 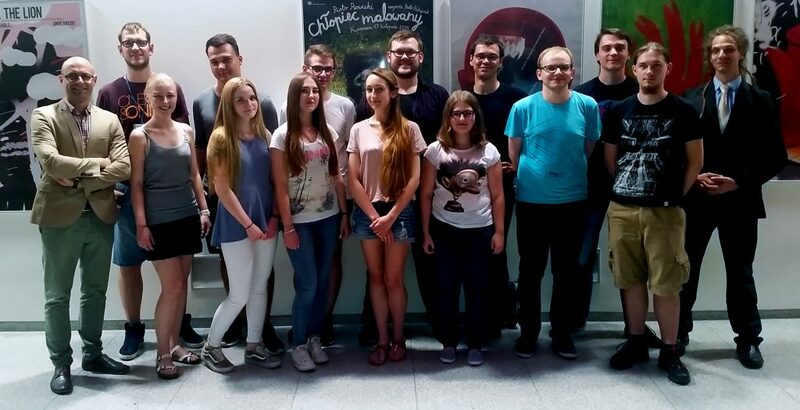 Finalist of 56th and 57th Polish Chemistry Olympiad (2010, 2011), and Winner of 16th Adam Mickiewicz University Chemistry Contest (2011). Scholar of the Ministry of Education (2011, Poland), and Ministry of Science and Higher Education (2016, Poland). Ambassador of Academic Poznań (since 2011). In 2011 he began studying at Adam Mickiewicz University, and and three years later he received his B. Sc. degree for the project entitled: „Disiloxane pyridyl derivatives- synthesis and complexation properties” under the supervision of dr hab. Błażej Gierczyk. In 2014 he joined the Stefankiewicz research group, where in 2016 he received his M. Sc. degree for the project entitled: „Hierarchical Self-Organisation of Amino-Acid-Derived NDI assemblies into a nanofibrillar superstructure”. The same year he started PhD studies, where he works mainly on the non-covalent supramolecular polymers. Anna Brzechwa was born in 1992 in Poznań, Poland. She started studying chemistry in 2011 at the Faculty of Chemistry at Adam Mickiewicz University in Poznań. In 2014 she received her BSc for the work titled UV-filters in cosmetics. In the same year she began her MSc degree and joined the Stefankiewicz research group. During her post-graduate studies she worked on dynamic libraries of boronic esters and also participated in a 3-month internship at the Institut de Science et d’Ingénierie Supramoléculaires in France, where she worked on the electrochemical exfoliation of graphene. In 2016 she received her MSc degree in chemistry for the work titled „Generation of dynamic libraries of boronic esters. Preparation of graphene in the process of electrochemical exfoliation of graphite. Generating a film of Graphene”. 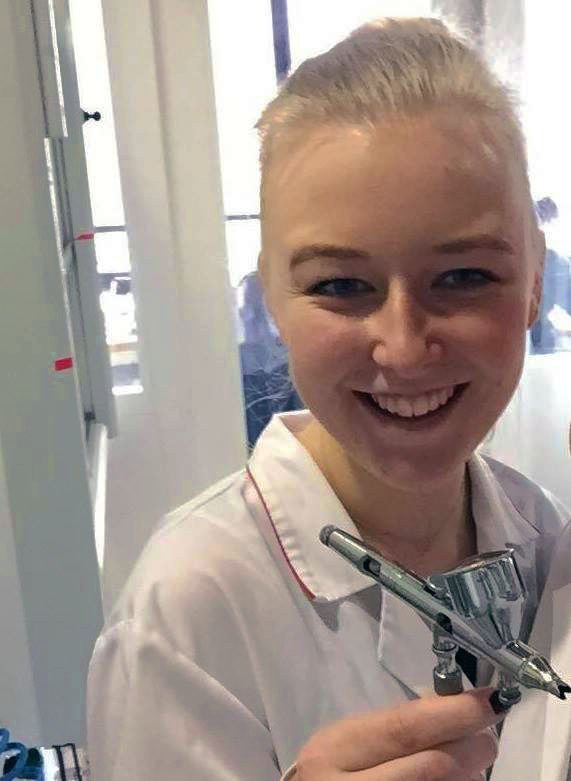 After completing her MSc degree, she took up the position of Quality Manager at the Berg+Schmidt company, after a year in the corporation decided to return to the world of science. Now (2018) she has returned to the Stefankiewicz research group and began her PhD studies. She is working on non-covalent supramolecular architectures. Miroslava Čonková was born in 1991 in Poprad, Slovakia. In 2010 she started studying Chemistry at Faculty of Natural Sciences at Pavol Jozef Šafárik University in Košice. Two years later (2012) she joined Prof. Gonda’s group and in 2013 recieved B.Sc. degree. In the same year she started scientific research in the project „Diastereoselective synthesis of advanced intermediate for Salinosporamide A synthesis“ and in 2015 she recieved M.Sc. degree with honours in Organic Chemistry. Because of her passion for chemistry she continued research in the same university and for two years she was working in target oriented synthesis and in 2017 she recieved slovakian academic degree abbreviated as RNDr. for the project „Total synthesis of unusual sphingoid bases“. In 2018 she started PhD studies and joined Stefankiewicz research group. Miłosz Piechocki was born in 1995 in Poznań. He started studying Materials Chemistry in 2014 at Adam Mickiewicz University in Poznan. He is also a member of Scientific Association of Chemists of Adam Mickiewicz University. From January 2016 to February 2017 was President of departamental Scientifc Association of Chemists, and currently vice-President. He really enjoy performing chemical experiments shows, beacause he can demonstrate interesting chemistry world, which always fascinated him. He joined the Stefankiewicz group in september 2015 and his work is focused on development of metal-organic frameworks. Filip Perlitius was born in 1995 in Wrocław. In 2014 he is a chemistry student specializing in the analitical chemistry at the Adam Mickiewicz University in Poznan. In February 2015 he joined the Stefankiewicz research group. His work is focused on hydrogen bonding architectures and supramolecular polymers. Gracjan Kurpik was born in 1995 in Września. He is interested in chemistry since he was a child. In 2015 he began studying chemistry, specialty, general chemistry at the Adam Mickiewicz University in Poznań. In May 2015 he joined the Stefankiewicz research group. Lidia Wawrzyniak was born in 1995 in Radziejów, Poland. Since 2014 she is studying chemistry at the Adam Mickiewicz University in Poznań. In May 2015 she joined the Stefankiewicz research group as bechelor student.